Although there is no replacement for getting your hands dirty with finger paints, technology can offer many ways for students to be creative when making art. 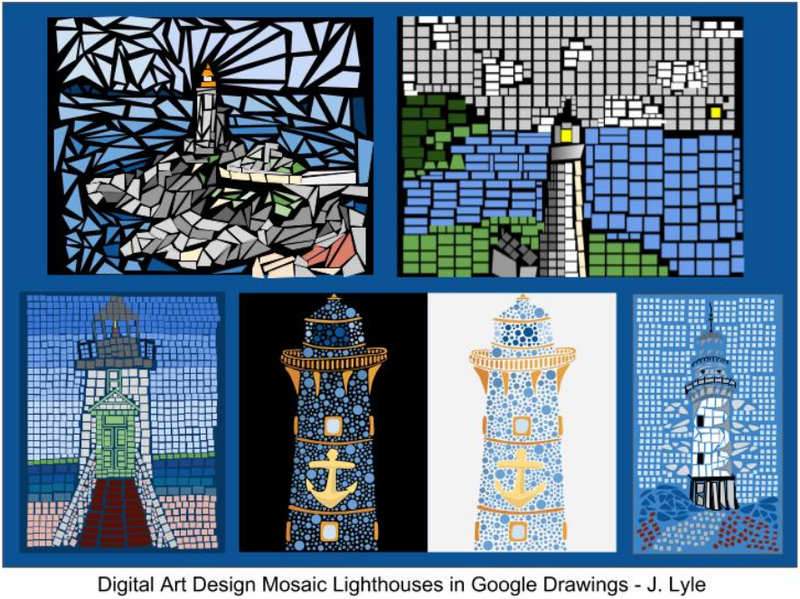 In addition to creativity, technology can also allow students to explore and learn about art in new and engaging ways. 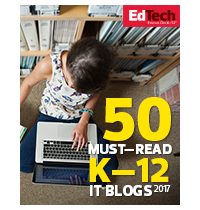 There are so many awesome technology tools for art, including desktop programs, mobile apps, and interactive websites. 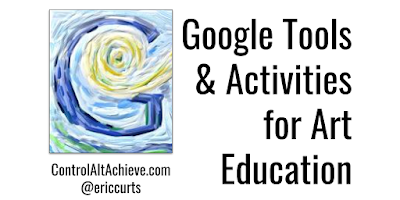 Along with all of those, there are many tools from Google that can help with teaching, learning, exploring, and creating art. 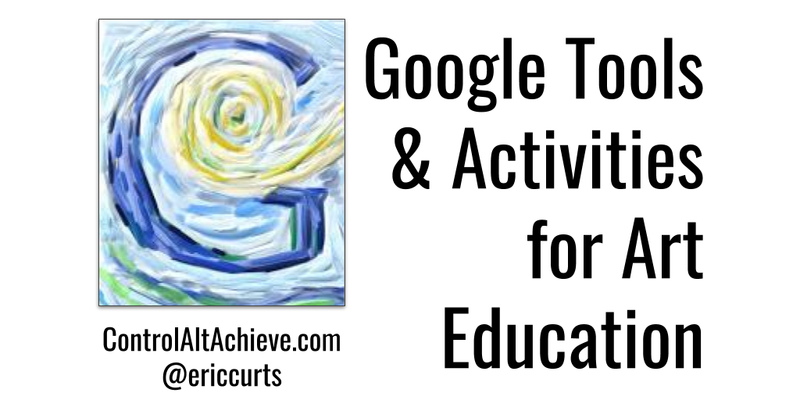 In this blog post we will look at a wide range of Googley tools and activities for art. Many of these have shown up in one form or other on my blog in the past, but I thought it would be helpful to pull them all together in one place. 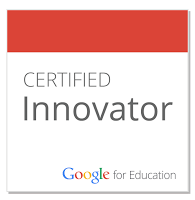 As I come across more resources in the future, I will be sure to add them to this growing list. See below for the activities, and as always, feel free to use and share however you like! "Pixel Art" is a style of drawing where you make images out of a small grid with limited number of colors (sort of like the old video game graphics from when I was a kid). This can be a neat art activity for students as is forces them to be creative within the limitations of a small area and color palette, and consider what is really essential to illustrate an item or idea. 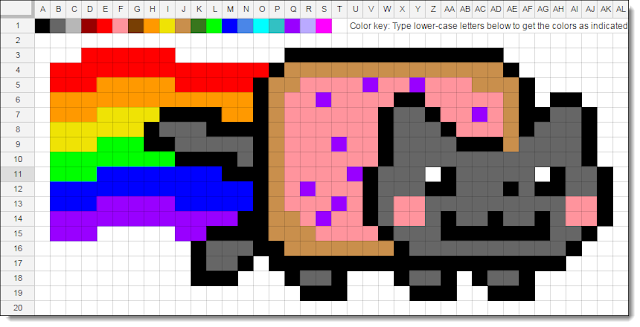 One way to create pixel art is by coloring in the cells on a spreadsheet. This can be done with the "paint can" button in Google Sheets, but to make the process quicker and easier, I created a spreadsheet template that uses conditional formatting. All you have to do is type letters into the cells and corresponding colors will be filled in. 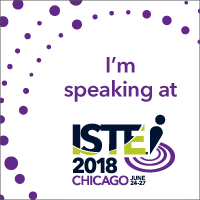 For full details and directions on how to use the template, see my earlier post "Pixel Art Activities for any Subject with Google Sheets". You can get the template there or make a copy of it with the link below. Mondrian Art is an abstract form of art that uses a creative layout of squares and rectangles, often filled in with primary colors. Because Mondrian Art is composed of lots of different sized rectangles and squares, it is the perfect style to be created with digital tools... specifically with Google Sheets! With Google Sheets you can merge cells together to make rectangles of various sizes, and then use the "paint can" button to fill them in with colors. To make this even easier, I have created a template that sets up the Sheet so that the cells are all nice squares. 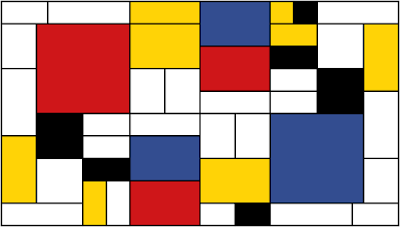 You can get all of the detailed directions on how to make Mondrian Art in my earlier blog post "Make Mondrian Art with Google Sheets". 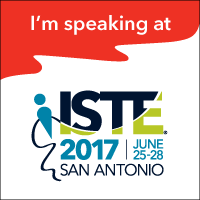 Anyone who reads my blog knows how much I love Google Drawings (see my Drawings resources here). Recently I came across an awesome activity from Julie Lyle on using Drawings to create self-portraits. 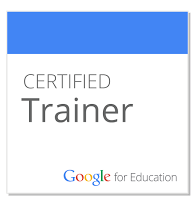 Create a Google Drawing and insert a photo of yourself. Next use the "Polyline" tool and the "Curve" tool to make colored shapes for all of the different portions of your picture. 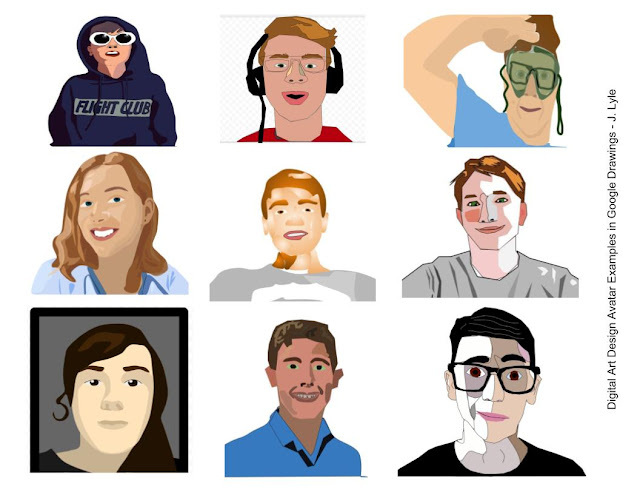 When done, you can then delete your original underlying photo and you will be left with a digital "clipart-style" image of yourself. Bonus note: Although you can use any colors you want, if you prefer to try to match the original colors in your photo you can use a color picker extension for Chrome such as ColorZilla or Eye Dropper. Create a Google Drawing and set the background to black. Then insert the photo you want to transform. Next use any of the "Shape" tools or the "Polyline" tool to cover the image with quadrilaterals, triangles, or other shapes that fit your desired style. Leave some room between the shapes so the background can show through later. Color in the shapes to match the portion of the image they are covering (again you can go with the default colors provided in Drawings, or you can use a color picker extension such as ColorZilla or Eye Dropper and then set a custom fill color). When done, delete the original image so that you just have your colors tiles on the black background for you completed mosaic art. Google Arts & Culture is a website from the Google Cultural Institute dedicated to collecting and sharing art, photographs, and primary source documents from all over the world and throughout history. Items are organized by themes, artists, mediums, movements, historical events, historical people, places around the world, stories of the day, and more. 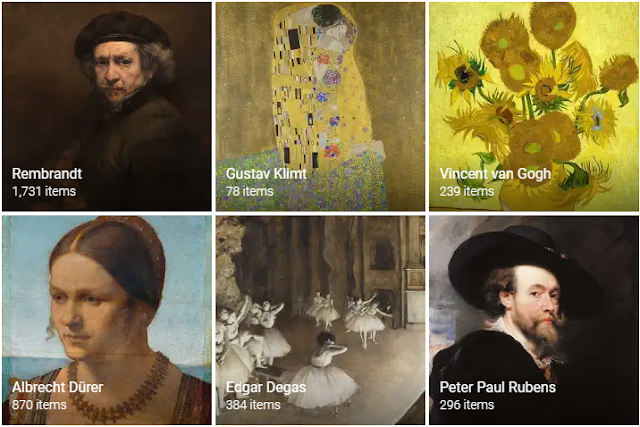 With Google Arts & Culture (https://artsandculture.google.com) students can get closer to works of art and historical artifacts than they ever could in a museum. The digital items were scanned or photographed by Google using an ultra-high resolution camera so you can see every brush stroke, letter, or detail. Some of the collections even feature 360-degree videos and photos to immerse you in the experience. In addition to the amazing website, there is also a mobile app version of Google Arts and Culture (Android or iOS) that adds another fun tool. 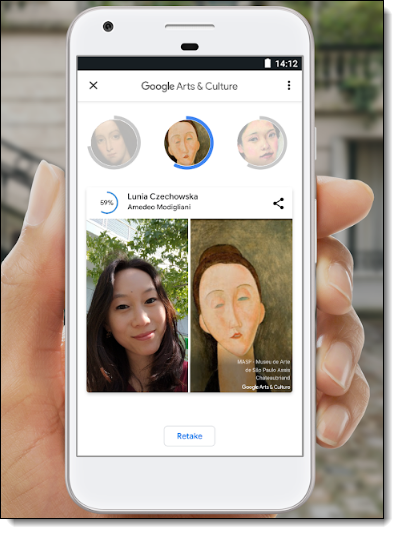 The mobile version includes the "Selfie" option that lets you take a picture of your face, and then it searches thousands of artworks to see if any look like you. Curator Table is one of Google's "experiments" which creates a massive virtual 3D gallery of artwork you can explore. You can use your mouse to simply browse, or you can use the search feature to pull out art for a specific artist, styles, or object. When you find the art you want, clicking on it will open a page with more details on that work. Use the color bar at the top to select the colors you want to include in your palette. 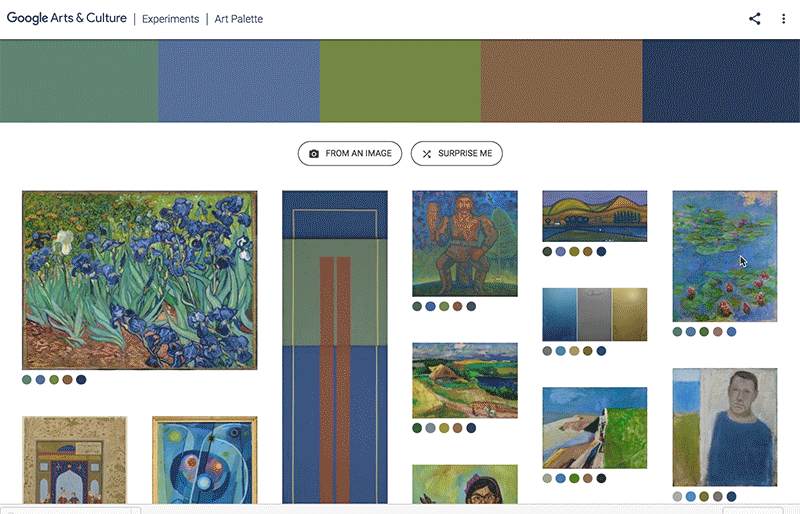 Google will now display a grid of artwork that use the colors you have chosen. Alternately you can click the "From an image" button to upload a picture or use your webcam to take a picture for the site to match against. AutoDraw is a very simple and easy to use drawing tool, with most of the normal features such as drawing, filling colors, resizing, adding text, and more. However, there is one big twist. AutoDraw includes Google's artificial intelligence to help you draw by taking your squiggles and doodles, and offering to replace them with pre-made clipart-style images. For detailed directions on how to use this tool, see my earlier post here: "Using Google AutoDraw for Sketchnotes, Infographics, Drawings, and More"
Launch the app and point your camera at your surroundings. Use your finger to draw in the air a few feet in front of you. Walk around to draw in different locations. As you move around you can see your 3D drawing superimposed in your physical space. You can click the "Draw with a partner" button to let someone join you to draw together in the same space. You can click the "Record" button to make a video of your 3D art to share with others. All the way back in 1998, Google launched their first "Google Doodle". The company founders were going to spend a week at the Burning Man Festival and wanted to let people know they would be out of the office. So they changed the normal Google logo on the site to one that included the Burning Man logo for the second "O". Since then it has been a staple of the website to show creative versions of the Google logo to celebrate events, people, and ideas. 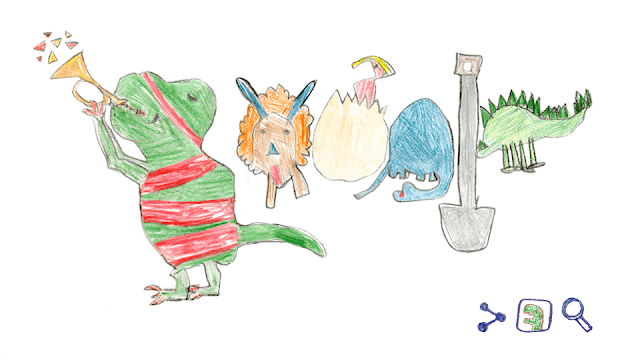 Building on this, starting in 2008 Google has hosted an annual "Doodle for Google" contest. 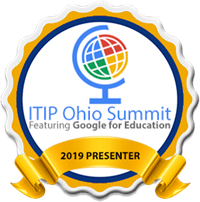 K-12 students can create and submit their own artwork for the Google logo for a chance to have it displayed on Google's site and win some great scholarships and tech packages for their schools. Art is a powerful tool for student learning and expression. 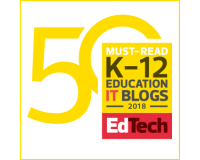 Technology can provide many ways to enrich and extend this experience. 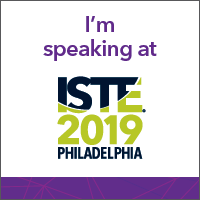 If you have other technology resources that are helpful in teaching, learning, and creating with art, please consider sharing them in the comments below. As always Eric, you share great ideas. Here's an art resource, not as Googley, but still cool for the artist in all of us. Love this list! Thanks Eric!